You may freely circulate patterns with the Copyright Statement Preserved. This is small blanket or cot cover made from 12 crochet squares in chunky yarn (so quick to make). 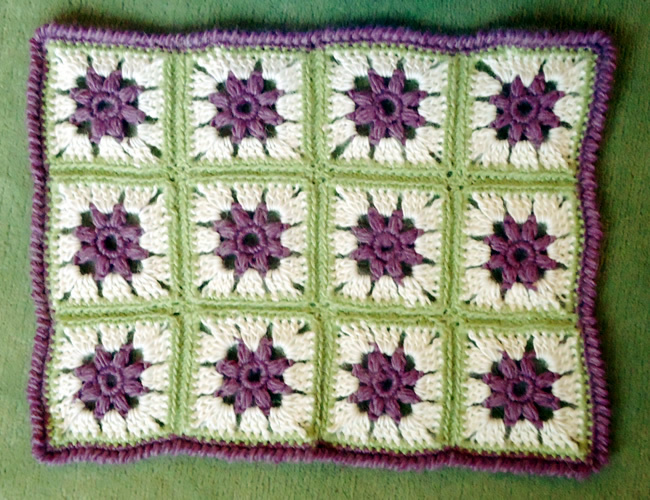 It's based the usual granny-square principle, but a very pretty example of it incorporating the central flower motif. There are a couple of new stitches used in this pattern, as well as basic chain, dc, and treble. 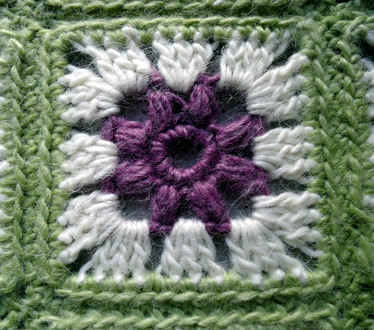 There is a "cluster" used in making the central flower, and crab stitch for the edging. Working all into the same stitch, **yoh, draw through loop **; repeat from ** to ** 4 times (9 loops on hook); yoh, draw loop through all loops on hook; yoh, draw loop through stitch on hook. Crab stitch is worked exactly as you do double crochet - but from right to left instead of left to right. It seems very awkward but just force yourself to do it; push the hook through the stitch to the right of your needle, pull through a loop, then yoh and pull through both loops on hook. It creates a very attractive twisted ribbed edge. There a is you tube extract inserted at end of this item - or go search the web for "crab stitch" for a variety of explanations. Starting at the centre of the square: using 7mm hook and first contrast, (plum), make 6ch and join in a ring using a slip stitch. 1st round: 8dc into the ring and join with a slip stitch to top of first dc. 2nd round: **1 cluster in first dc, 3ch; 1 cluster in next dc, 1ch **; repeat from ** to ** 3 times more, and join with a slip stitch to top of first st.
Change to second contrast (cream). 3rd round: Insert hook in first 3-chain space and make 2 chain for first treble; **2tr in same space, 3ch; 3tr in same space, 1ch; 3tr in next 1-chain space, 1ch; 1tr in next 3-chain space, ** repeat from ** to ** 3 times more, omitting the very last tr in the repeated sequence, and join with a slip stitch to top of first chains. Change to third contrast (lime). 4th round: 1 dc **1dc over each of next 3tr, 3dc into next 3-chain space; 1dc over each of next 3tr, 1dc into next 1-chain space; 1dc over each of next 3tr, 1dc into next 1-chain space;**. Repeat from ** to ** 3 times more, and join with a slip stitch to top of first dc. With 7mm hook and 3rd contrast (lime), join 2 squares together; hold right sides together and slip stitch through the back loop of each dc, leaving the front loops exposed as a decorative ridge on the right side (see photos). Join 3 squares in a row, then join the 4 rows together. Finally, using first contrast (plum) and right side facing, work a row of dc all around the blanket, and work 2 or 3sts into the 4 corner sts, to make it curve properly. Then, keeping the right side facing you, change to a 6mm hook and go back the way you came, working one row of crab stitch right to left. Block the blanket by pinning it out and dampening; leave to dry. You can press very lightly with a damp cloth - just hold the iron above the cloth so it heats it but do not press down. You want to leave the texture of the stitches in place, so do not press heavily. 2 x 50g balls of chunky in each of first and second contrast and 1 ball in third contrast. One No 2 (7mm) and one No 4 (6mm) crochet hook. Each square is intended to measure 4¾ inches. To fit cot, pram, or Moses basket. A word on the wool. The original yarn produces a tension of 13sts x 19 rows to 4 ins over stocking stitch. You can substitute an Aran weight yarn worked double throughout, though this is less easy to work with for crochet patterns. I used Patons Pompero a chunky yarn, knitting to a tension of 16sts x 22 rows to 4 ins, which is thinner, though I used a 7mm hook with it. Result of my yarn choice is a smaller blanket, requiring only one ball in each colour. In transposing any pattern it is always a risk that errors will be introduced, in spite of dedicated proof reading. If you have any problems with this pattern, please and I will try and assist. (a picture painting a thousand words and so on).